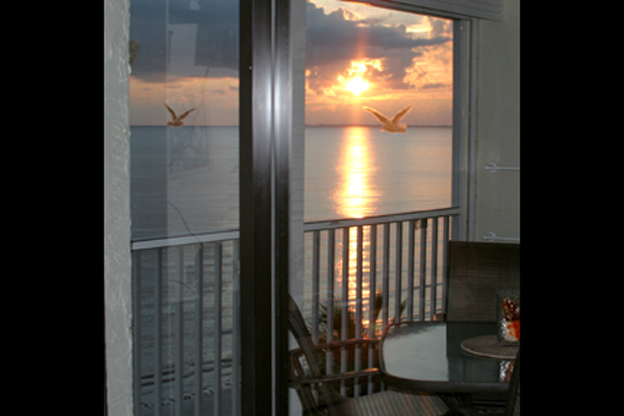 My Ft Myers Beach Florida condo is directly on the Gulf of Mexico with a fourth floor breathtaking view of sunsets every evening. 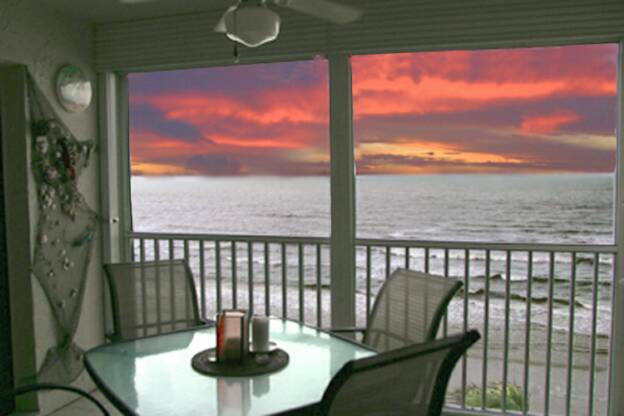 Very close to restaurants, shopping, groceries, and the best Florida has to offer from fishing to para-sailing. A high speed Key West Catamaran is five minutes away, and an island trolley stops in front to take you around. Churches and fishing pier are nearby also. 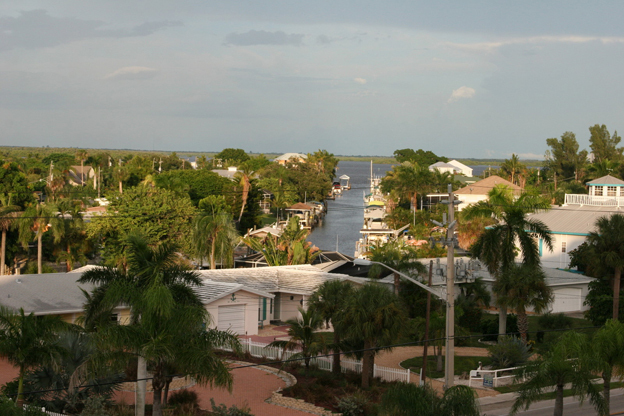 RATED #1 CONDO ON FORT MYERS BEACH since 1999! Completely furnished turn key apartment completely remodeled from front to back, just bring your clothes. 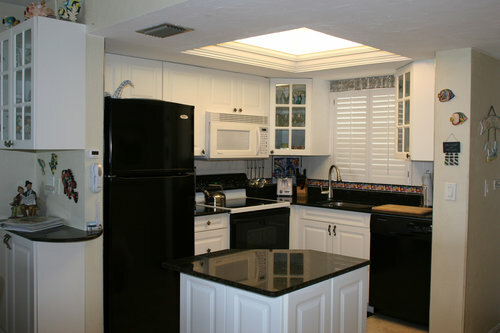 Heated pool, four gas BBQ grills, shuffleboard and complete laundry facilities. 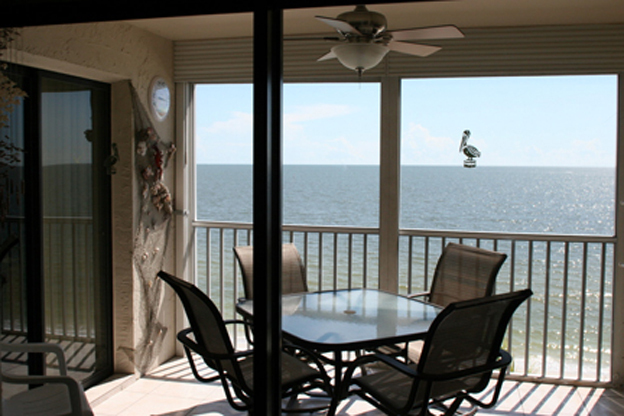 The condo includes three ceiling fans, central Air Conditioning, screened patio right on the Gulf, walk-in master closet, three NEW Digital LCD TV's (40in. TV in the living room), 2 DVD's plus BLUERAY with Netflix, Stereo/CD IPOD system, VIDEO Game system with 70 games, Cordless phone, all linens, and a fully-equipped newly remodled kitchen with Granite Counters. Bring your K Cups because I just added a Keurig Coffee maker, There is a 12 cup drip maker as well and grinder for your beans. CLICK THE LINK BELOW TO VIEW MY PERSONAL WEBSITE WITH A COMPLETE TOUR OF THE CONDO. The following terms and conditions, along with the rental confirmation, represent the Rental Agreement between Guest and Smuggler’s Cove Condominium, Inc. No variations of the Rental Agreement shall be valid unless agreed by Smuggler’s Cove in writing. Smuggler’s Cove accepts no liability for or guarantees the accuracy of verbal conversations. Upon receipt of a booking confirmation, Guest enters into a direct contract with Smuggler’s Cove. Guest has the right to decline these conditions by notifying Smuggler’s Cove in writing within 24 hours of receipt of booking confirmation. Payment Terms: A $300 non-refundable credit card payment is due when reservation is made (Visa, MasterCard or Discover). Balance is due 60 days prior to arrival (Visa, MasterCard, Discover or check). Unpaid reservations are automatically cancelled 60 days prior to arrival without refund. Rebooking is subject to availability. Credit Card Authorization: Guest understands and consents to the use of the credit card provided without original signature on the charge slip, that an email of payment confirmation will serve as payment consent, and that this Credit Card Authorization cannot be revoked. Rental Restrictions: We do not rent to groups, or teens with chaperones. Any guest under the age of 25 unaccompanied by a parent or legal guardian will not be permitted to occupy a condo at Smuggler’s Cove. Only registered guest and number of persons listed in the rental confirmation may use or occupy any part of the premises. Guests may not invite other persons to make use of the premise or the amenities. Guests are not permitted to organize events (parties, reunions, weddings, receptions, or other similar events) on/in the property. Smuggler’s Cove can arrange for events to take place in its Community Room, however all events must be approved in writing by Smuggler’s Cove in advance. Guest may not assign or transfer any reservation and must occupy the unit for the duration of the stay. Any reservations made under false pretense will result in loss of payment and removal from the premises. Cancellations: All cancellations must be in writing (e-mails sent to sunnfun@smugglerscovecondo.com are acceptable), and are effective only upon receipt by Smuggler’s Cove. 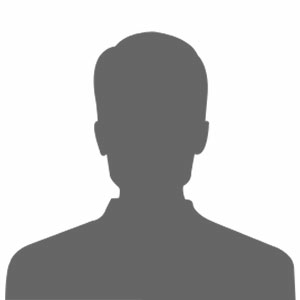 It is the responsibility of Guest to retain proof of any such cancellation. The initial $300 payment is non-refundable. Cancellations within 60 days of arrival date are non-refundable. Travel protection insurance is recommended in case of any unforeseen events. Visit insuremytrip.com for travel insurance information. No Smoking: We do not permit smoking in rental units, pool area, stairwells, or any enclosed area. If there is evidence of smoking inside of a property your credit card will be charged for smoke odor removal. 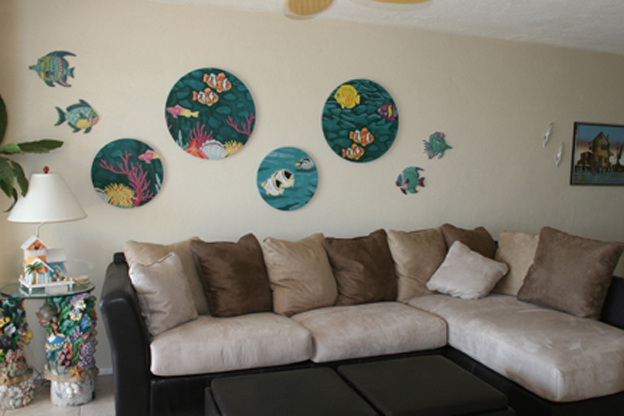 Furnishings – Our vacation rentals are individually owned and furnished by each owner to their individual taste. Please do not rearrange the furniture, take any items outside that are part of the interior décor, move any furniture or furnishings, or take kitchen items to another unit. Although every effort has been made for accuracy, Smuggler’s Cove is not responsible for errors on this website for property changes made by unit owners or for any conditions beyond our control upon arrival. Note: Rental agent represents property to the best of their ability and assumes no liability for errors or omissions. Self-Catering Rental: Complimentary start-up supplies include 1 roll toilet paper per bathroom, 2 small bar soaps per bathroom, 1 roll paper towels, 1 small kitchen dish soap, and 2 packets dishwasher detergent. Extra items needed are the responsibility of the guest. Check-in: Begins at 3 p.m. Plan your arrival accordingly as keys will not be available prior to 3 p.m. due to cleaning and maintenance schedules. When office is closed, arriving guests will obtain keys & parking permits from the lock-box located directly in front of the office. The code to open the lock-box is printed on the rental confirmation. Check-out: Drop the keys in the drop-box located directly in front of the office no later than 10 a.m. on the departure date listed on the confirmation. It is critical that the property be vacated by the time housekeeping crews arrive at 10 a.m.
are located at the end of each parking lot. Turn ceiling fans to low, turn off all lights, set thermostat to 78 degrees, and lock all windows and doors. Place all keys in drop-box located in front of office prior to 10 a.m. on scheduled day of departure. $25 lost key fee will be charged to credit card on file. Personal Items: Smuggler’s Cove is not responsible for lost, missing or stolen items, items left behind after departure, or any damages to persons or their property. Personal items may not be stored on chairs, benches, tables, walkways, stairwells, pool area, under buildings, community and laundry rooms, tiki huts, or elsewhere on the Smuggler’s Cove property. Shipping fees plus a $25 service charge will be charged for returning items left behind. Occupancy: Occupants receive no interest in real property, but merely acquired a license to use the condominium subject to the right of Smuggler’s Cove to change accommodations up to and including the date of arrival. Due to change of unit ownership, removal of unit from rental program, mechanical failures and other conditions, a specific unit cannot be 100% guaranteed. In the event the status of the unit changes, we reserve the right to reassign guest to another unit. Termination of Occupancy: Smuggler’s Cove is committed to being a good neighbor, and asks that you be considerate of those who are living near your unit. Unfortunately, from time to time some occupants disturb their neighbors, by creating excessive noise, smoke, or other nuisances. Smuggler’s Cove expressly reserves the right to terminate, at any time, your occupancy of your unit, and to evict you from the unit, in the event that complaints are lodged which indicate that you are disturbing the neighbors. In that event, you will also forfeit all monies previously paid to Smuggler’s Cove. Repairs: Although we cannot guarantee the operation of all equipment and appliances, our maintenance staff makes every reasonable effort to ensure that the equipment and appliances are in working order; however, no refunds are given for equipment or appliance failure. Swimming Pool: Open between 9 a.m. – dusk. Closed when outdoor temperature is below 65 degrees. There is no lifeguard on duty. Guests assume the risks of use. Only registered guests permitted in pool area. Children must be supervised at all times. Please obey rules that are posted at the pool. Agents Right of Entry: An authorized employee or repairman may enter the premises at any time in order to inspect, repair, and maintain the unit and in order to confirm that the unit is being used in accordance with the terms of these policies. The unit you occupy may be listed for sale. If so, there is a possibility that you will be contacted to request a showing during your stay. Disclaimer: Smuggler’s Cove Condominium is the agent of the property owner, and is acting in and for the best interest of the owners. Smuggler’s Cove is not responsible for circumstances beyond their control such as pollution, noise, including construction, allergens, public or private events, interruption of services or utilities, including elevator, pool, power, water, phone, internet, cable TV, appliance breakdowns, weather conditions, guest emergencies or schedule changes, or conditions which affect the use of the beach. We do not provide refunds due to cancelled or shortened stays. We suggest travel insurance to cover unforeseen circumstances. Video game system with 70 games.